Well I could hardly write so much about his time on the air and not comment on his going off, now could I? As I read through the online chatter about The Olbermann/MSNBC divorce I am amazed how the left sound exactly like FOX viewers would sound if O’Reilly got canned. 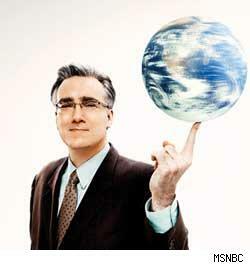 I love Olbermann’s show, and I will miss it, but there is a great article on Salon.com about this. In many ways Keith was done in by his own success. When he built Countdown from just another pundit show to liberal “must see” in ’06 with his “special comment” take down of Rumsfeld that went viral he gave the station direction and, for the first time, less-than-crappy ratings. Since then they have built a lineup that while leaning to the left is also diverse and informative, backing their opinions with fact. The truth will come out over time, but looking at how he went, the terms of his exit, etc, I consider it far more likely that in the end the decision to go was his. Those who are all over “the interwebs” screaming COMCAST CONSPIRACY! CORPORATE PLOT! do us all a disservice. The problem with seeing conspiracies everywhere is that the real ones can slip by easier. Olbermann has been fired after a few years for being snarky with his bosses nearly everywhere he was worked. Yesterday was not exceptional, it was the rule. In the meantime, if you want to turn off your TV and leave the medium to the Right out of indignation by all means go ahead. However, you would accomplish more by voting with your viewership. Everyone who stops watching Rachel Maddow because Keith is gone is sending one message to the owners of ALL media, that the Right are loyal to an idea while the Left are only loyal to a person. I don’t think that is the message we want to send. hard to turn off in his relationships with others. You rock. Thanks for making sense of a lot of things I tend to ignore because of all the people that scream conspiracy at every turn. That just seems like a cop out to me sometimes.